Would you like to hear yourself on my next album? Because I'd like your voice there. It's free, easy, and will take you about 17.3 seconds. It may look like I no longer make music, or that I must've fallen off the side of a mountain in a blaze of glory in an effort to save endangered baby elephants from tyrannical poachers and warlords, never to be seen again. (Neither is true, although I did almost fall off the roof of a bus and plummet to my certain death down a mountain in Nepal - long story). I'm still very much here, and I can't thank you enough for still being there. It has taken a while to adjust to being back home from my year spent volunteering at orphanages around the world, but I'm back now. And lots and lots of new music is coming soon, and so much of it is influenced by my journey and what I experienced. I learned so much from each of the incredible kids I met along the way. They helped temper my soul, helped make me stronger. And I believe you will hear that in the music. Thank you for your support, my friends. Talk soon. The Fall of Atlas - Out NOW! 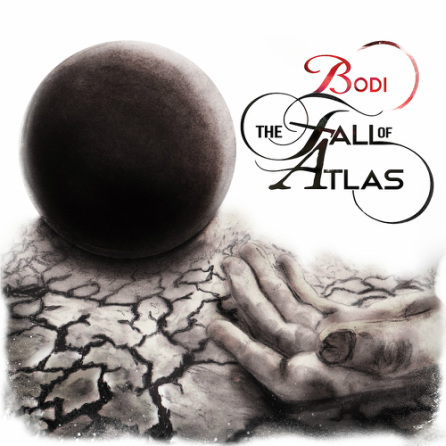 I'm so, so happy to finally announce the release of my new album, The Fall of Atlas. I put every part of myself into this record. I wrote the first song for it 5 years ago while I was on break working at an Italian restaurant. Since then, life has presented itself with some heft. It has been a humbling, beautiful, painful, triumphant journey, and I hope the changes that followed have seen me grow in a positive way…I think they have. I've learned one thing with absolute certainty: life is beautiful, even when it isn't. I made this album to show that. 3 years ago, I was working as a corrections officer in a max security juvenile jail. I'd work 12 hour shifts, then come home and work on the music for about 8 hours. Then repeat. Now, thanks to you, music is my full time gig. I went to Kenya for a while, and the experiences that I had with the children in the orphanages changed my life forever. I toured with some childhood idols, who became friends. Then, death arrived with unstoppable force. I hadn't really ever experienced death before the last couple years, and then I lost two grandparents, three friends, and my childhood dog within a years time. There may be no better teacher to show how truly fragile this dance of life is, and how much each moment matters, because they do. I made this album in testament to them, and in thanks to you. Thank you for being with me through the rise and the fall. I promise I'll continue to be by your side through yours. Thank you for being a beautiful person in a world that isn't always so. p.s. I'll be traveling the world for the next year or so, but let's stay in touch. www.thevolunteeradventure.com will have all of the info. Deluxe Order: $15. Comes with an autographed, individually #'d copy of the album on CD, a handwritten thank you note, and a hi-res digital copy of the album. Two days after I received The Fall of Atlas in the mail, I boarded a plane bound for Ho Chi Minh City, Vietnam. That proved to be the start of a journey that I've been planning for about three years: The Volunteer Adventure. I packed up everything I own, put it in an old coat closet, and put the music on hold for a bit on a quest to put my film degree to use to make an honest documentary about the lives of orphaned children around the world, with no filter. Their story in their own words. Right now, I'm in Romania, 6 months into the journey. Before here, I was volunteering at orphanages in Vietnam, Cambodia, Nepal, Kenya, and South Africa. It has been an adventure I will only forget once I'm old and gray (if that day comes) and forget how to remember. I can't wait to share my experiences with you when I get back home, and to give you new music that has been burning in my chest for the last 6 months. This trip has been possible only by the generous donation of people like you: my fans, friends, and family. If you're reading this, chances are I consider you all of those. I also put my entire life savings into this. I've got about 6 months to go, and money isn't really a commodity that's growing on trees out here. Since I'm volunteering, I'm not getting paid. I really want to finish this journey and documentary with the vision I fully imagined since day one. So I'm asking for your help to contribute to the adventure. When you do, you'll get some pretty great things in return from me: handwritten postcards, autographed copies of the documentary, your name in the credits, framed pictures, etc. I'm doing this because there are millions of orphans around the world, living in abject poverty, whose living conditions are improved all the more when people know about their lives. When I volunteered in two orphanages in Kenya in 2010, I promised myself I could've wave goodbye unless I would one day return and wave hello. I feel that I have a chance to give back to a world and my fellow brothers and sisters that have allowed me to humbly live a wonderful life. I don't plan on squandering that opportunity. I believe it is our duty, as responsible human beings and stewards for the good, to use the energy in our means to help ensure every orphaned child in the world is cared for. Together, we can positively influence the lives of innumerable children around the globe and help provide each with caring support, humanitarian aid, and the ability to pursue their dreams. Life is as an adventure. I hope you'll join me. Clotho is the sister of fate responsible for spinning the thread of human life. This song is about cutting those strings, controlling our own destiny, and walking our own path. 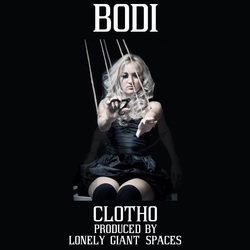 Listen to the track below, and feel free to share and spread the word. You can download it riiight here. There is a lot of new music and new merchandise in the pipeline, so it only makes sense to have a fancy new store to present them all to you! 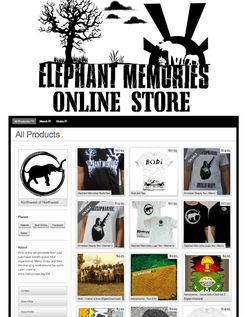 Head on over to the Elephant Memories Online Store. I think you'll like what we've done with the place. And, the first 10 of you who order from the store will receive 50% off your ENTIRE order. No limit on the order size!